A J train of R179s at Flushing Avenue. A Z train of R160s at Kosciuszko Street. The J Nassau Street Local and Z Nassau Street Express are two rapid transit services in the B Division of the New York City Subway. Their route emblems, or "bullets", are colored brown since they use the BMT Nassau Street Line in Lower Manhattan. The J operates at all times while the Z, operating internally as its rush-hour variant, runs with six trips in each peak direction on weekdays; both services use the entire BMT Archer Avenue, Jamaica, and Nassau Street lines between Jamaica Center–Parsons/Archer in Jamaica, Queens and Broad Street in Lower Manhattan (via the Williamsburg Bridge between Brooklyn and Manhattan). When the Z operates, the two services form a skip-stop pair between Sutphin Boulevard–Archer Avenue–JFK Airport and Marcy Avenue. Also on weekdays during midday and rush hours, J/Z trains run express in each peak direction in Brooklyn between Myrtle Avenue and Marcy Avenue, bypassing three stations. At all other times, only the J operates, serving every station on its entire route. The current J/Z descends from several routes, including the JJ/15 between Lower Manhattan and 168th Street in Queens; the KK between 57th Street in Midtown Manhattan and 168th Street in Queens; the QJ between 168th Street in Queens and Brighton Beach in Brooklyn; and the 14 between Lower Manhattan and Canarsie–Rockaway Parkway. The current skip-stop pattern was implemented in 1988. The Jamaica Line – then known as the Broadway Elevated – was one of the original elevated lines in Brooklyn, completed in 1893 from Cypress Hills west to Broadway Ferry in Williamsburg. It was then a two-track line, with a single local service between the two ends, and a second east of Gates Avenue, where the Lexington Avenue Elevated merged. This second service later became the 12, and was eliminated on October 13, 1950 with the abandonment of the Lexington Avenue Elevated. The second major service on the Broadway Elevated ran between Canarsie and Williamsburg via the BMT Canarsie Line, started on July 30, 1906, when the Broadway and Canarsie tracks were connected at East New York. As part of the Dual Contracts, an extension from Cypress Hills east to Jamaica was completed on July 3, 1918, a third track was added west of East New York, and express trains began running on it in 1922. The Brooklyn–Manhattan Transit Corporation numbered its services in 1924, and the Canarsie and Jamaica services became 14 and 15. Both ran express during rush hours in the peak direction west of East New York. Express trains would only stop at Myrtle Avenue, Essex Street and Canal Street, before making local stops afterwards. Additional 14 trains, between Eastern Parkway or Atlantic Avenue on the Canarsie Line and Manhattan provided rush-hour local service on Broadway. When the 14th Street–Eastern Line and Canarsie Line were connected on July 14, 1928, the old Canarsie Line service was renamed the Broadway (Brooklyn) Line, providing only weekday local service over the Broadway Elevated west of Eastern Parkway. The Atlantic Avenue trips remained, and rush-hour trains continued to serve Rockaway Parkway (Canarsie), though they did not use the Broadway express tracks. The 14 was later cut back to only rush-hour service. On the Manhattan end, the first extension was made on September 16, 1908, when the Williamsburg Bridge subway tracks opened. Broadway and Canarsie trains were extended to the new Essex Street terminal, and further to Chambers Street when the line was extended on August 4, 1913. When the BMT Nassau Street Line was completed on May 30, 1931, the 15 was extended to Broad Street, and the 14 was truncated to Canal Street. Some 14 trains began terminating at Crescent Street on the Jamaica Line in 1956. This brochure describes the introduction of A/B skip-stop service on the No. 14 and No. 15 services of the BMT Jamaica Line on June 18, 1959.
Letters were assigned to most BMT services in the early 1960s. The BMT Jamaica services retained their numbers until November 1967. The 15 became the QJ (express), and the 14 became the JJ. When the Chrystie Street Connection opened on November 26, 1967, many services were changed. The two local services - the JJ (non-rush hours) and KK (rush hours) - were combined as the JJ, but without any major routing changes. Thus non-rush hour JJ trains ran between Jamaica and Broad Street, while morning rush hour JJ trains ran to Canal Street, and afternoon rush hour JJ trains ran between Canal Street and Atlantic Avenue or Crescent Street. The rush-hour express J was combined with the weekday QT Brighton Local via tunnel to form the weekday QJ, running between Jamaica and Brighton Beach via the Jamaica Line (express during rush hours in the peak direction), BMT Nassau Street Line, Montague Street Tunnel, and BMT Brighton Line (local). Finally, the RJ was a special peak-direction rush-hour service, running fully local on the Jamaica Line, Nassau Street Line, Montague Street Tunnel, and BMT Fourth Avenue Line to 95th Street in Fort Hamilton. This was an extension of a former rush-hour RR service, and thus ran towards Jamaica in the morning and towards Fort Hamilton in the afternoon. The next change was made on July 1, 1968, when the Chrystie Street Connection tracks to the Williamsburg Bridge opened. 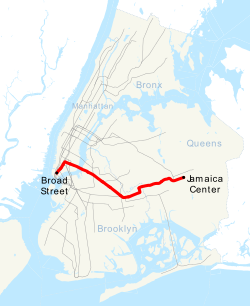 The Jamaica Line portion of the rush-hour JJ was modified to become a new rush-hour KK, running between Jamaica (peak direction) or Eastern Parkway (both directions) and the new 57th Street station on the IND Sixth Avenue Line in Manhattan. The MM (depicted with a dark green bullet on R27 signage) was a proposed alternative to the KK as a local to 57th Street/6th Avenue, which finally opened on July 1, 1968. The RJ was eliminated, being cut back to an RR variant, and the off-hour JJ was relabeled QJ (but not extended to Brighton Beach). At the same time, the existing skip-stop service was extended to afternoon Jamaica-bound trains, with those QJ trains running express west of Eastern Parkway and serving "A" stations east to Jamaica, and those KK trains serving "B" stations. Less than two months later, on August 18, the QJ was extended to Coney Island–Stillwell Avenue. On January 2, 1973, the QJ, which was the longest route in the transit system, was cut back to Broad Street and redesignated the J; and the M was extended to Coney Island in its place. At the same time, the KK was cut back to Eastern Parkway from 168th Street and renamed the K, and both skip-stop patterns were carried out by alternate J trains. Eventually, the K was discontinued entirely on August 30, 1976, eliminating the J skip-stop and express service east of Myrtle Avenue in the PM rush hour. Skip-stop service was retained toward Manhattan during the AM rush hour. One-way express service remained west of Myrtle Avenue, since the M was switched to the local tracks at that time. The following table summarizes the changes that were made between 1959 and 1976. Sample of rolling stock currently used on the J and Z. From top: R42, R160, R179. From left to right: Trains in J and Z service. The J was truncated to Queens Boulevard just after midnight on September 11, 1977, and to 121st Street on April 15, 1985, as portions of the elevated Jamaica Line closed and were demolished. The Q49 shuttle bus replaced service at the closed stations until 1988. The BMT Archer Avenue Line opened on December 11, 1988, extending the line back east from 121st Street to Jamaica Center–Parsons/Archer. The Z train first ran that day, introducing the present J/Z skip-stop pattern. The new Z trains would go skip-stop between Jamaica Center and Broadway Junction (later extended to Myrtle Avenue) during rush hours, then making all J stops to Broad Street. Bus service on several Queens bus routes was rerouted to serve Jamaica Center instead of the 169th Street station several blocks away. The J/Z skip-stop service was touted as being faster to lower Manhattan than E, F, and R service, in an attempt to relieve some crowding on the IND Queens Boulevard Line. Because the MTA hoped that Queens passengers would transfer to the J/Z from the E, F, and R, every subway car on the J and Z's fleet was completely graffiti-free. On September 30, 1990, weekend J service was cut back to Canal Street, but it was extended back to Chambers Street in January 1994. From May 1 to September 1, 1999, the Williamsburg Bridge was closed for reconstruction. J trains ran only between Jamaica Center–Parsons/Archer and Myrtle Avenue. J/Z skip-stop service operated in both directions between Jamaica Center and Eastern Parkway-Broadway Junction. During the closure, B39 bus service over the Williamsburg Bridge was free. The closure was anticipated to last until October 1999, but regular subway service was restored one month ahead of schedule. The project cost $130 million, including replacing the tracks support structure, signal system and other equipment. On September 1, 1999, J and Z trains, which previously skipped Bowery between 6 a.m. and 8 p.m. on weekdays, began stopping there at all times. After the September 11, 2001 attacks, service on the BMT Broadway Line in Lower Manhattan, and R service, was suspended. J trains were extended beyond Broad Street via the Montague Street Tunnel to replace the R to Bay Ridge–95th Street at all times except late nights, when it only ran to Broad Street and a shuttle ran in Brooklyn between 95th and 36th Streets. J/Z skip-stop service was suspended. Normal service on all three trains was restored on October 28. In May 2014, all trains began stopping at Alabama Avenue, presumably for the convenience of transit employees who work at the nearby East New York Yard and East New York Bus Depot. In July 2014, the MTA proposed that weekend J service be extended from Chambers Street to Broad Street. The service change went into effect on June 14, 2015. From June 26, 2017 to April 27, 2018, J and Z trains ran local between Broadway Junction and Marcy Avenue at all times, supplementing the M, due to the BMT Myrtle Avenue Line connection being closed for reconstruction. For a more detailed station listing, see the articles on the lines listed above. Stations in green and stations in blue denote stops served by the J and Z, respectively, during rush hours in the peak direction. The J makes all stops at all other times. 111th Street Station is closed for renovations until mid-2019. ^ Some northbound trains begin their trips at this station and continue to Jamaica Center during the early a.m. rush hour; some northbound trains from Broad Street end their trips at this station during the late a.m. rush hour. ^ "Subdivision 'B' Car Assignments: Cars Required June 24, 2018" (PDF). 61 (7). Electric Railroaders' Association. July 2018: 16. Retrieved November 8, 2018. ^ a b "J/Z Subway Timetable, Effective June 24, 2018" (PDF). Metropolitan Transportation Authority. Retrieved June 24, 2018. ^ "Line Colors". mta.info. Metropolitan Transportation Authority. Retrieved October 7, 2018. ^ "SUB-DIVISION B TRAIN OPERATOR/CONDUCTOR ROAD & NON-ROAD WORK PROGRAMS IN EFFECT: NOVEMBER 6, 2016" (PDF). progressiveaction.info. New York City Transit. July 29, 2016. Retrieved August 19, 2016. ^ "Trains Running This Morning". Brooklyn Daily Eagle. Brooklyn, NY. May 30, 1893. p. 10. ^ "Better Service on the Brooklyn L". Brooklyn Daily Eagle. Brooklyn, NY. December 20, 1893. p. 12. 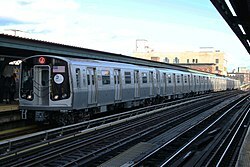 ^ "Brooklyn 'El' Link Dies With Aplomb; Celebrants Pack Last Train to Run on Lexington Spur, Soon to Be Torn Down In Service For 65 Years Riders Were So Scarce That Its 8 Stations Were Closed at Night for Last 10 Years". The New York Times. October 14, 1950. ISSN 0362-4331. Retrieved April 4, 2018. ^ "The BRT Opens Its New Extension for Through Traffic". The New York Times. July 31, 1906. p. 12. Retrieved March 20, 2010. ^ "New Subway Line". The New York Times. July 7, 1918. p. 30. Retrieved March 20, 2010. ^ "Celebrate Opening of New B. M. T. Line". The New York Times. July 15, 1928. p. 13. Retrieved March 20, 2010. ^ "Mayor Runs a Train Over New Bridge". The New York Times. September 17, 1908. p. 16. Retrieved March 20, 2010. ^ "Bridge Loop to Open for One Line Only". The New York Times. August 3, 1913. p. 6. Retrieved March 20, 2010. ^ "Nassau St. Service Outlined by B. M. T." The New York Times. May 21, 1931. p. 29. Retrieved March 20, 2010. ^ "Mayor Drives Train in New Subway Link". The New York Times. May 30, 1931. p. 11. Retrieved March 20, 2010. ^ a b "Jamaica BMT to Start Speed-Up Tomorrow". The New York Times. June 17, 1959. p. 28. Retrieved March 20, 2010. ^ "Skip Stop on the BMT Jamaica Line". www.thejoekorner.com. New York City Transit Authority. 1959. Retrieved October 7, 2018. ^ Walsh, Kevin (May 9, 2010). "Thank You For Your Service Retired line designations Page 2". forgotten-ny.com. Retrieved October 7, 2018. ^ "KK A New Service". www.thejoekorner.com. New York City Transit Authority. 1968. Retrieved October 7, 2018. ^ "Subway Schedules In Queens Changing Amid Some Protest". The New York Times. January 2, 1973. p. 46. Retrieved March 20, 2010. ^ "Changes Set for Jan. 2 Praised" (PDF). New York Times. November 25, 1972. Retrieved January 25, 2016. ^ "Transit Agency Drops 215 Runs". The New York Times. August 31, 1976. p. 42. Retrieved March 20, 2010. ^ "Service Adjustment on BMT and IND Lines Effective 1 A.M. Monday, Aug. 30". Flickr. New York City Transit Authority. 1976. Retrieved October 23, 2016. ^ Dembart, Lee (September 9, 1977). "A Sentimental Journey on the BMT..." The New York Times. p. 61. Retrieved March 20, 2010. ^ "Spring (April) 1985 Subway Map". Flickr. New York City Transit Authority. April 1985. Retrieved October 7, 2018. ^ Johnson, Kirk (December 9, 1988). "Big Changes For Subways Are to Begin". The New York Times. p. B1. Retrieved March 20, 2010. ^ "System-Wide Changes In Subway Service Effective Sunday, December 11, 1988". Flickr. New York City Transit Authority. 1988. Retrieved June 17, 2016. ^ Feinman, Mark S. (December 8, 2004). "The New York Transit Authority in the 1980s". www.nycsubway.org. Retrieved October 7, 2018. ^ "Service Changes September 30, 1990" (PDF). subwaynut.com. New York City Transit Authority. September 30, 1990. Retrieved May 1, 2016. ^ Glickman, Todd (October 6, 1998). "Archive of NYC Subway Maps". mit.edu. Retrieved July 28, 2016. ^ "January 1994 Subway Map". www.railfanwindow.com. Metropolitan Transportation Authority. 1993. Retrieved September 30, 2018. ^ "No Trains Over The Williamsburg Bridge". subwaynut.com. Metropolitan Transportation Authority. 1999. Retrieved June 6, 2016. ^ Williams, Monte (May 4, 1999). "Most Straphangers Unfazed By Closing of Bridge Lines". The New York Times. ISSN 0362-4331. Retrieved June 6, 2016. ^ Rutenburg, James (April 27, 1999). "6-Month Bridgework To Disrupt J, M, Z Lines". New York Daily News. Retrieved June 6, 2016 – via fishq.info. ^ "Williamsburg Bridge Map 1999". Flickr. New York City Transit. 1999. Retrieved October 7, 2018. ^ "NYC DOT - Williamsburg Bridge". www.nyc.gov. New York City Department of Transportation. Retrieved June 6, 2016. ^ Donohue, Pete (September 2, 1999). "It's J -As In Joy- Train Riders Flying High On Fixed-Up W'Burg Span". New York Daily News. Retrieved June 6, 2016. ^ "Rapid Transit Challenge". www.rapidtransitchallenge.com. Retrieved December 31, 2017. ^ Soltren, Jose. "September 19, 2001 Subway Map". nycsubway.org. Retrieved October 23, 2016. ^ Calcago, Michael. "October 28, 2001 Subway Map". nycsubway.org. Retrieved October 23, 2016. ^ Donohue, Pete (July 24, 2014). "MTA to upgrade weekend service on J train, restore it on LIRR's West Hempstead Branch". New York Daily News. Retrieved October 23, 2016. ^ "2015 Service Enhancements". mta.info. Metropolitan Transportation Authority. 2015. Retrieved October 7, 2018. ^ "J/Z Subway Timetable: Now Available: Broad St Station service at all times" (PDF). mta.info. June 14, 2015. Archived (PDF) from the original on September 5, 2015. Retrieved October 7, 2018. ^ Rivoli, Dan (March 17, 2016). "M line to be shut down next year for repairs". New York Daily News. Retrieved July 23, 2016. ^ Brown, Nicole (March 18, 2016). "MTA: M line will shut down for part of next year". am New York. Retrieved July 23, 2016. ^ "Myrtle Avenue Line Infrastructure Projects". mta.info. Metropolitan Transportation Authority. Retrieved July 23, 2016. Wikimedia Commons has media related to J (New York City Subway service) and Z (New York City Subway service). "J/Z Subway Timetable, Effective June 24, 2018" (PDF). Metropolitan Transportation Authority. Retrieved June 24, 2018.